Receive free brake inspections and free brake pads the month of October in support of finding a vaccine to prevent breast cancer. Imagine a world free of breast cancer where your daughters or granddaughters never have to fall victim to such a widespread disease. 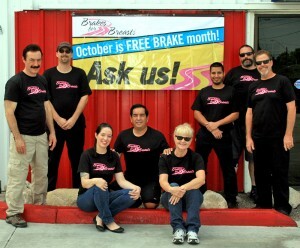 We’re teaming up again with automotive shops across the country to “Put The Brakes on Cancer” by participating in Brakes for Breasts… the only organization focused on PREVENTING breast cancer! For more information on the Cleveland Clinic Breast Cancer Vaccine Fund visit brakesforbreasts.org. For the whole month of October, we’re performing FREE BRAKE INSPECTIONS. For every brake service performed at our shop your OEM brake pads will be FREE! All you have to do is pay the labor cost and for any additional parts needed. We will then donate 10% of your brake service to The Cleveland Clinic Breast Cancer Vaccine Research Fund! Call (520) 888-6575 or use the form below to request an appointment to receive your free brake inspection or free brake pads in support of the Cleveland Clinic Breast Cancer Vaccine Fund. Hurry! The FREE brake pad offer is only good in the month of October. Stop by today! Please note that some specialty vehicles with greater than average pad requirements may be subject to additional charges. Please contact us for more information. I was ready to get rid of my BMW because our dealership seems to have a very unsatisfactory service department. You changed my mind! your assessment & work was thorough, quick, and excellent. I’m thrilled to have straightforward, quick and understandable answers to my concerns and needed work and my car back in shape!!! So quickly & easily! Who knew it was possible right here in Tucson!